On Saturday Feb 21st 2015 the Sierra Leone Ireland Partnership and the Liberia Solidarity Group host an Interfaith Service to reflect on the consequences of the Ebola Crisis in West Africa, remember the victims and those who are left behind, and to look with hope towards the future for this beautiful part of the world. The expected attendance of over one hundred people will include Guest of Honour, President Michael D. Higgins, members of the Liberia Solidarity Group the Sierra Leone Ireland Partnership, people from Sierra Leone, Liberia and Guinea, and others who have lived and worked in the area. Prayers and reflections will be offered in the form of readings, poems and music in an hour long service. The event will also look to the future pledging solidarity and support in the times ahead for survivors and their families. The current outbreak in West Africa, where the first cases were flagged in March 2014, is the largest and most complex Ebola outbreak since the virus was first discovered in 1976. With almost 25, 000 suspected cases and 8,600 lives claimed in the region, this Ebola outbreak has seen more cases and deaths than all others combined. The most severely affected countries, Sierra Leone, Liberia and Guinea, having only recently emerged from long periods of conflict and instability, have very weak health systems, lacking the necessary human and infrastructural resources to overcome such anepidemic. This structural instability exacerbated the crisis and means that its repercussions will have on-going impact on the health and well being of communities across West Africa, particularly those who are most vulnerable. SLIP honours Irish people’s 150-year-old relationship with the people of Sierra Leone. It is a focus point for people in Ireland who have personal, professional, spiritual or family ties to Sierra Leone. 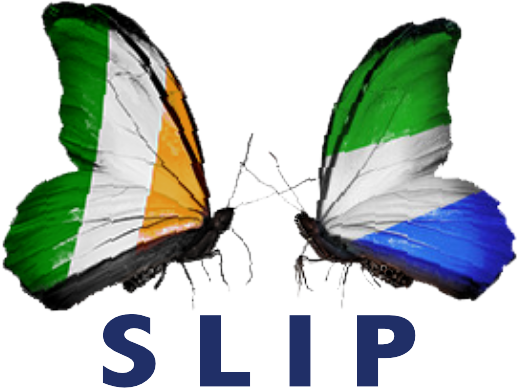 Founded in 1991, in response to the outbreak of the civil war in Sierra Leone, SLIP is involved in awareness raising and advocacy for Sierra Leone in Ireland. LSG is dedicated to the creation of a mutual learning partnership between Ireland and Liberia which promotes justice, peace, equality and human rights through collective action and sustainable development. We support those working to achieve these goals through education, enterprise and community development activities, including actions that promote or enhance the status of women.